HBI works in a microcosm of its former offices at Downtown Crossing. There are many lunchtime options, places to buy clothes and shoes, and shops for our daily fix of office candy. We even have our own version of the Filenes hole in the ground at the former Ferdinand’s Blue Store, slated for development next year. Gradually, we’re learning the new landscape and enjoying the adventure of discovery. 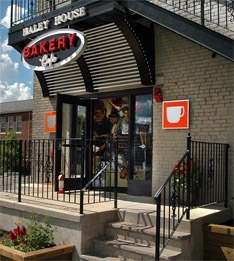 By this time, we are “regulars” at Haley House, a newer institution in Dudley that is the lunch hub for neighbors and workers. In what looks like a hip, cool, yuppie lunch spot, Haley House’s managers and staff are carrying out a really important mission. They train at-risk young people in food services and culinary arts and are devoted to the justice of good, healthy food for everyone. The group of men and women who prepare awesome meals at Haley House have become a steady presence in our daily lives too. Our immediate neighbor is the “Bikini Bar” at Aga’s Highland Tap, the only adult entertainment business outside of downtown, dating to 1945. We’ve gotten to know the owners in our first months but haven’t, shall we say, patronized this long-time establishment yet. We occasionally glimpse bikini-clad gals having a smoke outside, but Aga’s is pretty quiet and staid most of the time. Further up Washington Street, we’ve spent time with colleagues at Boston Community Capital in the old Palladio Hall building, heard some great jazz at Hibernian Hall with about 75 Roxberians, and tucked into small lunch spots like the Silver Spoon and a little Ethiopian counter in the Woopie Pie factory. It is interesting to note that Dudley is home to almost every major retail Bank in Boston with a full-service branch for each. We’ve been told that this was home to the original First National Bank of Boston. There’s also a lot that we haven’t explored: Hibernian Hall plays host to a long list of music, theater and dance events in the evenings. Bodies by Brandy is a popular health club that also caters to kids and young adults. And Boston Urban Gardens is a shop focused on the city dweller’s predilection for small green spaces. In a short while the newness of this adventure will be over, but for now, our new home, although only a few miles from our old one, affords us a chance to make new friends and see our city from a new perspective.